Clerkenwell Design Week 2016: Benjamin Hubert's London studio Layer has unveiled designs for a made-to-measure wheelchair that will be manufactured using 3D-printing technology. The Go wheelchair prototype, set to debut at Clerkenwell Design Week later this month, is the result of a six-month research period carried out by Layer alongside wheelchair users and medical professionals. Described by the London-based studio as a "tool to improve the quality of life of wheelchair users", the 3D-printed chair will feature a made-to-measure seat and foot bay. Both of these customisable components can be created by mapping the individual user's biometric information and inputting the data into 3D-printing software – something Layer says would be a "world first" for consumer wheelchairs that aren't developed for athletes or as one-off projects. The seat is then printed in two materials – a semi-transparent resin and thermoplastic polyurethane (TPU) plastic that provides shock-absorption – while titanium will be used to construct the foot bay. "With the Go wheelchair, we saw an opportunity to really progress the manual mobility category for users with disabilities, and to use 3D-printing technology to solve significant and meaningful problems," said Hubert, who rebranded his studio as Layer last year to concentrate on more "human-focused" projects. "3D printing for manufacture is the most appropriate and powerful technology available to capture each individual's unique body shape to enhance the form and format of a very necessary product and provide exceptional performance," he said. 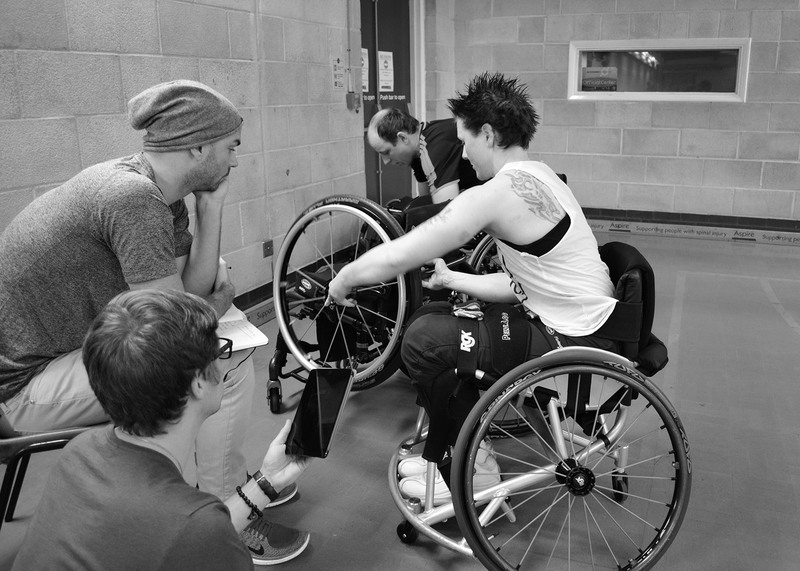 One of the main concerns raised by wheelchair users who took part in the research process was the strain and difficulty of self-propelling – particularly in wet conditions. In response to this, Layer has developed lightweight carbon-fibre spokes to fit inside the chair's wheels and has developed a wheel surface that is designed to lock into custom-made gloves. According to the studio, this glove system is the first of its kind, and decreases the risk of injury and painful conditions common to wheelchair users. The studio has also developed an app to accompany the wheelchair, which allows users to specify optional elements and colours. Once the wheelchair has been designed and ordered via the app, it could be delivered in under two weeks. Layer isn't the first design studio that has investigate the idea of improving the design of wheelchairs. British inventor Sam Pearce created a shock-absorbing wheel designed to help users negotiate uneven streets and rough terrain, whilst design studio Priestmangoode created a conceptual airline seat with a detachable wheelchair. The Go wheelchair will be launched at 155 Clerkenwell during Clerkenwell Design Week, which takes place this year from 24 to 26 May.